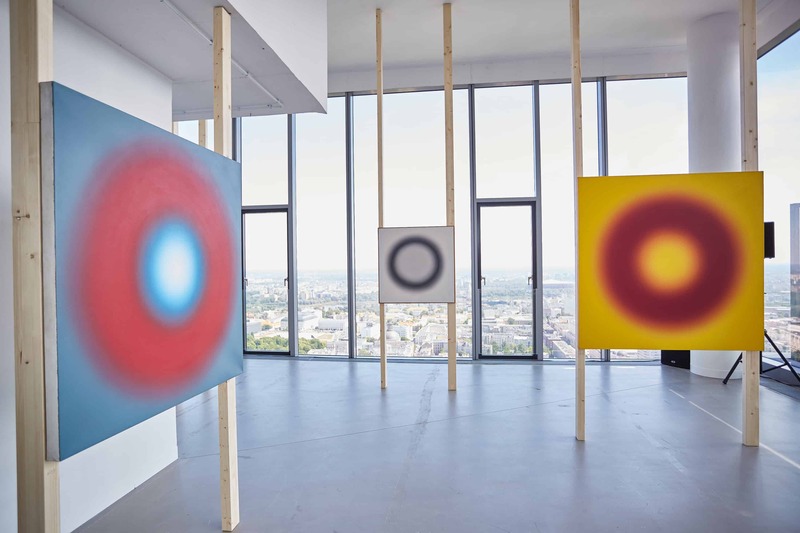 On the 60th anniversary of the premiere of the artist’s ground-breaking installation named “The Study of Space” in Warsaw, you can see the iconic paintings by Wojciech Fangor in the capital again. 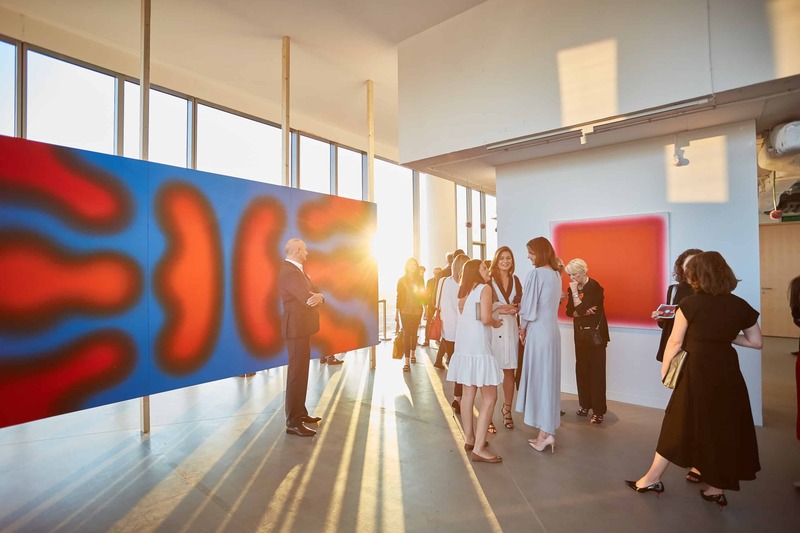 The exhibition entitled “FANGOR: Beyond the Visual Surface” presents 20 paintings from the private Jankilevitsch Collection. The core of the collection are the works by artists who created in the 1950s-70s, including Magdalena Abakanowicz, Jan Berdyszak, Kajetan Sosnowski, Henryk Stażewski, Ryszard Winiarski. It’s also the largest collection of Wojciech Fangors’ paintings in the world. ‘FANGOR: Beyond the Visual Surface’ exhibition, the private Jankilevitsch Collection. 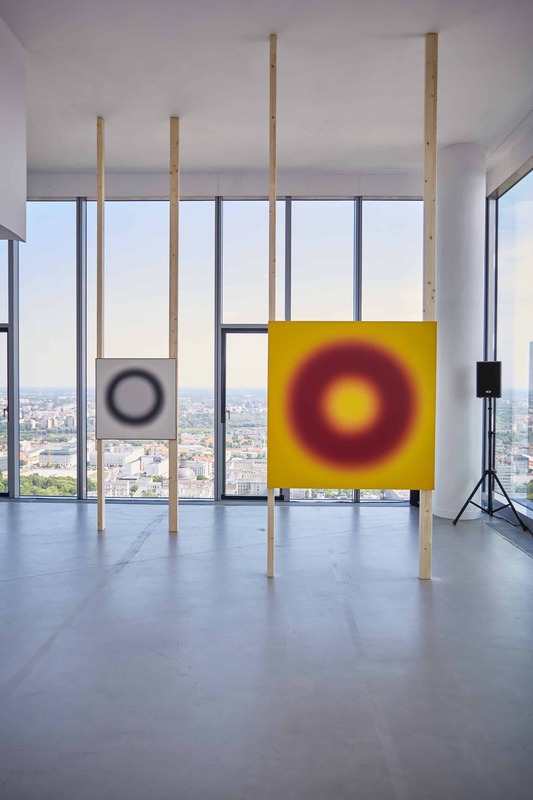 Dobromiła Błaszczyk: The current exhibition “FANGOR: Beyond the Visual Plane” draws inspiration from Wojciech Fangor’s “The Study of Space” a very early site-specific environmental work which consists of edgeless paintings, and with edgeless transition of colour. This work was absolutely different from what he was known for before. Could you tell me more about this ‘drastic’ change of his style/ technique? Katarzyna Wąs: In the 50s, Wojciech Fangor was mostly known for his realistic social paintings such as ‘Korean Mother’ (1951) or ‘Figures’ (1950). He was also one of the founders of the Polish Poster School, so he was focused on creating graphics and posters for theatres and movies. At the time, art in Poland was highly political. You could have been politically correct and have a well-paid job or gone to the underground and do the avant-garde art. Fangor has chosen the second option. In 1958, in Nowa Kultura Salon (New Culture), he and his close friend, architect Stanisław Zamecznik, managed to open an exhibition which turned out to be one of the first environmental work/ spacial installations in which visitors were an integral part of the work of art. These paintings were absolutely different from what he was known for before – black-and-white, minimalist and abstract. After this show, nothing remained the same. DB: Why was “The Study of Space” exhibition and the works included so revolutionary? How did it affect Fangor’s later works? KW: The most revolutionary element in this whole project was to show paintings off the walls – only four out of twenty included in the exhibition were hung traditionally. Instead, Fangor showcased them on wooden structures in the middle of the gallery space. 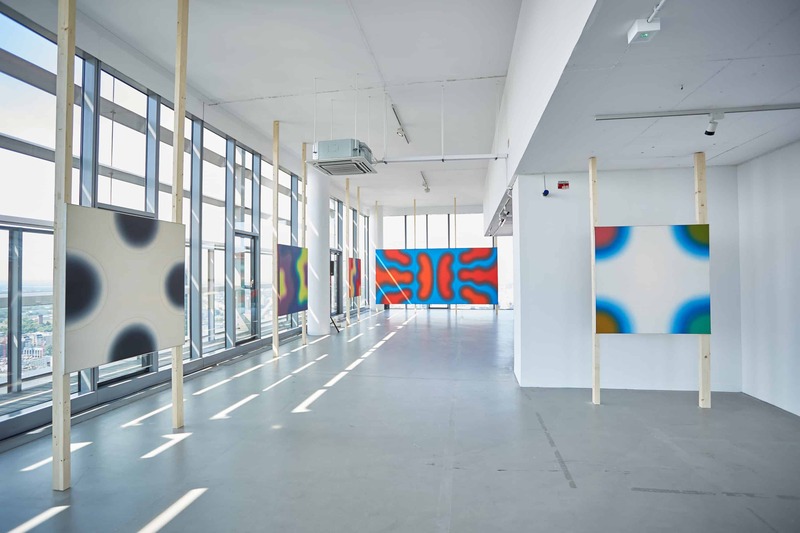 Paintings hung perpendicular to each other entered into mutual relations. A visitor hovering between them became one of the elements of the whole installation. The period after he created “The Study of Space” was very productive in his career. He travelled extensively looking for new possibilities. He met a gallerist and collector form Washington DC, Beatrice Perry who invited him to the United States. But before this life-changing step, he and Zamecznik decided to clarify their thoughts in the “Manifesto” published in 1960. He used to say that everything which had been before “The Study of Space” had led to it and all works which he did later resulted from it. After this gesture he started to create abstract paintings using black-and-white paint. Then, gradually he brought in colour and more complicated structures. In time the contour vanished and colours flowed into each other seamlessly giving the effect of pulsating movement. DB: How did he treat space then? KW: The space was for him like a stage where he could create a spectacle with his paintings and viewers. He had very close contact with architects so his sensibility to space was much more intense than other painters’ at the time. He was facing the question concerning relationships between different paintings as independent objects affecting the aura of the viewer. Crucial for this kinetic but at the same time sensual kind of perception was the constantly moveable viewer and different visual perspectives. DB: In our interview with Fangor that we published at Contemporary Lynx Magazine 1(3) 2015, he told us that “art is an artificial creative deception of the viewer” and that “perception of art relates to magic and illusion”. On the basis of the exhibition could you share your thoughts on how space traverse the borders and has an impact on the viewer? Or maybe each viewer creates the space between the paintings itself? KW: I think that there are two ways to understand this. One is given to us by the artist, so the image with the inner light and energy are very strong, very suggestive and create an illusion of painting going beyond the frame. But the second one is totally subjective. It depends on how we move, what our emotions are, what we feel this particular day. We can perceive the same painting in very different ways, depending on many factors. 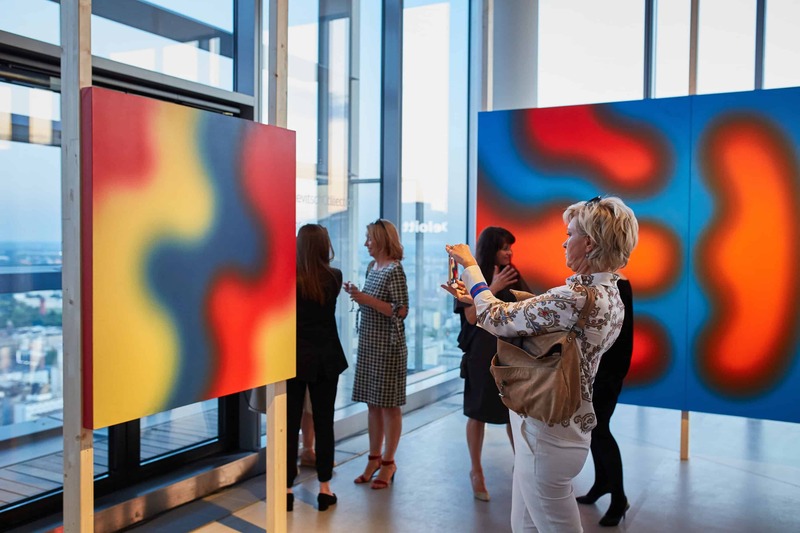 I think that this is the power of abstract painting – that you can feel and see what you want. 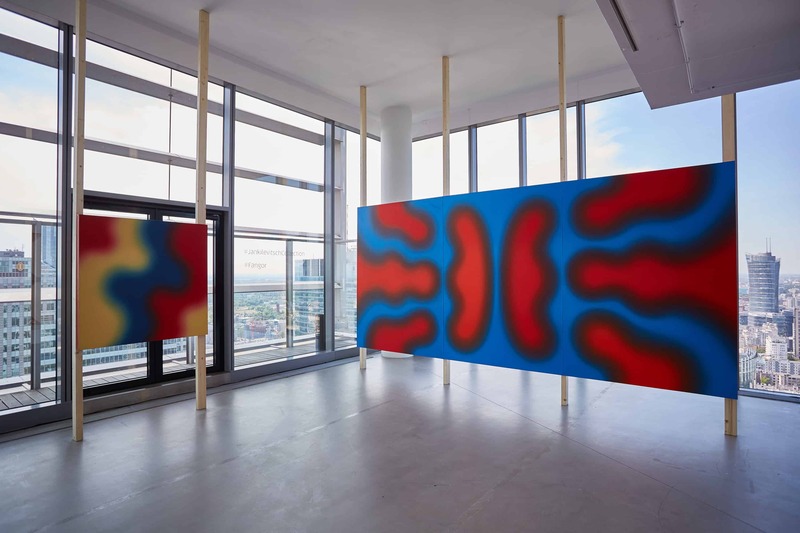 DB: The exhibition in Warsaw coincides with the premiere of the first international publication on Wojciech Fangor. The beautiful album entitled “Color and Space” is published by well-known Skira publishing house. Why has it taken so long for this first international publication about this world-famous artist? KW: Yes, correct. It is hard to understand why this book is only the first international publication about Wojciech Fangor. The need to show Fangor’s painting to a wider audience was indisputable. Skira is a publishing house with a very long tradition. They published such monographic books as catalogue raisonne of Piet Mondrian or Lucio Fontana. The author of “Color and Space” Magdalena Dabrowski, former MoMA curator, placed Fangor in his due place in the history of art. She put together his works with artists such as Allan Kaprow, Richard Serra or Mark Rothko. Inside this album you can also find a revealing article by Mark Rosenthal about the circle in Fangor’s work. But of course the illustrational part of the book is the most admirable. I think that Skira managed to capture perfectly the colours and the light of the paintings which isn’t easy, but is crucial in his works. DB: Jankilevitsch Collection is not only a collection per se, it has got a mission to popularise artists’ work. Could you tell me something more about the collection, and its main core? DB: …and you have the largest collection of Wojciech Fangors’ paintings in the world. Those twenty included in the exhibition are amazing, mesmerizing, they change our perception of time and space. And finally, as you mentioned above, after looking at them nothing remained the same. Katarzyna Wąs is an art historian, curator and art advisor. From 2013 she runs the Jankilevitsch Collection, private collection of modern and contemporary art based in Warsaw and Geneva.